Whoa that’s brutal. For two turns, anyway, then all the damage done is reversed. 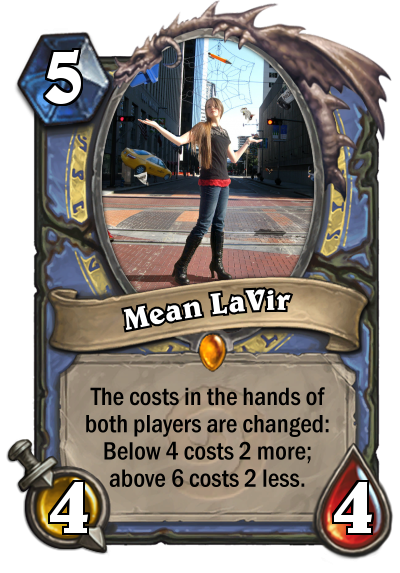 I’m not sure what good an effect like that would do in an online card game, but it makes one heck of a convenient plot device! I think it’s funny that if his health and attack were swapped with Crazed Alchemist a rogue could kill him with Backstab. The effect here is supposed to mimic his “odd water barrier.” Large objects are blocked by it, yet the tiny things can slip through. The 4-mana spell “Fireball” can still kill him, as revealed in the previous chapter. What’s really weird is that I somehow found a picture that looks almost like how I imagine Mackaba in my head. He even has handcuffs to signify his past as a police officer. I’m not quite sure what the deal is with the stag silhouette behind him, though. I’m sure it’s relevant to whoever drew this. Shoot, I forgot to write down where I got all this art from. I also forgot to ask for permission to use the art in the first place. Hm, the original picture file has the signature “Offish White.” Oh well; I can just ask them for permission when they come here to complain about how I pilfered their work for my own twisted reasons. I thought this effect would be pretty cool. No, wait, I don’t want to use a pun. It’s a “nifty” effect. 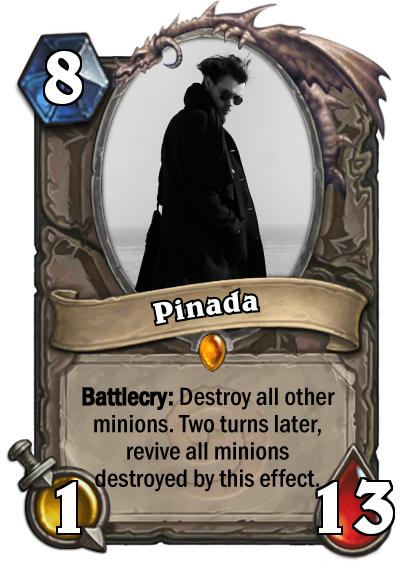 See, the problem with freeze minions in Hearthstone is that you have to wait a turn to attack with them. And I always want to freeze people NOW! 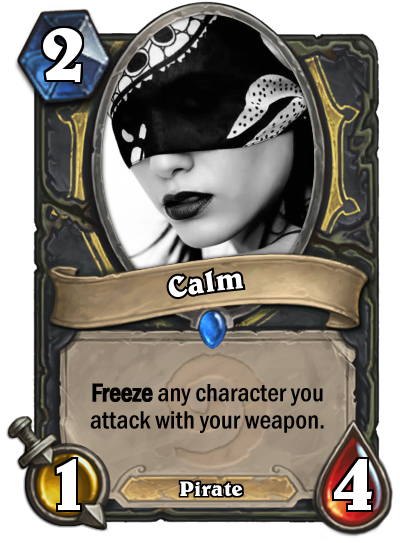 So with this card you could use your hero’s weapon to freeze right when you need it. And she’s a pirate because, uh, in this chapter it’s revealed that she is! Zounds! That’s all for now. 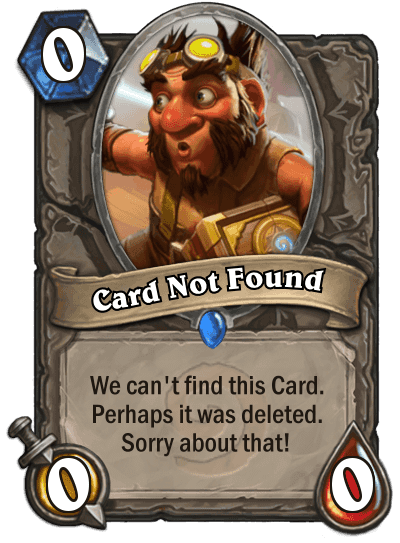 I used the site http://www.hearthcards.net/ to make all of these, so go there and make some more. And try harder next time, Matt! Now on to CHAPTER 23: THE TRUE PIRATE QUEEN EMERGES! Beebee appeared in a room of blinding light. Surfaces were all polished to brilliant radiance, surfaces of slabs that were positioned to face outward from a tall, central pillar. It was inlaid with devices and tools and they all fit together along the surface, filling every space. Shirka sat atop it. “Look who showed up first,” she announced at one of the slabs hovering in the air below her. Cougo was stuck to it, encased in armor, his arms outstretched. The armor had become transparent: his clothing beneath it was pressed flat to his body. “Is that really you?” he asked, wincing through his flat teeth. Beebee looked around her: at the slabs and the floor and then up at Shirka. “What else was I supposed to do, Shirka! ?” Cougo pleaded. His slab was facing an open space in the wall. A long, elegant branch from the tower stretched out above the gap, leading to the hazy wall of gas from Pladomir’s world. “Don’t get her upset, Cougo,” Beebee said. Her boots tapped on the sterile floor as she paced around the circle of slabs. Pladomir was pressed against the next one. “You idiots never had anyone to challenge you,” Shirka said. “Sitting fat with your planets while I struggled.” She struck her heel against the pillar; Pladomir’s slab swiveled up. She snatched one of the tools from its place and stood to face him as he hung, upside-down. She forced his head to the side. He could see the mist of his world and the glowing, frontal silhouette of a zeppelin rising from the edge of the glass. Lighting flashed from the first ship. “Let’s put out the doormat, huh?” Shirka said. Blurred shapes extended out from the hole in the tower; colors snapped into focus and a long docking port attached to the walls and floor with a clang. She tapped his visor again and he flew, still stuck to the slab, toward the end of the walkway that lead down the sky port. “Beebee, you can’t let her do this,” Cougo said as he faced a blank wall. Shirka tapped the tool against the top of his slab and he rose up to her level. “Do any of you even have a good reason?” she asked. She looked down through the ring strapped to her eye at Beebee. “Can you really tell me that letting them go would be for the best?” The lighting arced between the approaching zeppelins again, setting the closer one ablaze. “I did warn Beebee,” Shirka said. “But I guess she wanted to put all her little peasant fans in danger.” Beebee put her hand to her lips. “Well I tried playing nice,” Shirka said. She dropped to her knees and reached for a tool further down on the pillar. It appeared to be a key with a suction cup on the end. “This was one she used on us when we were awake,” Shirka stated as she stood up again. With a snap from her fingers Cougo’s slab pivoted up. “You remember what this is, Cougy-boy?” Shirka asked. She brushed against Cougo’s face and the slab swung on the spot; she stuck out her finger, stopping it with Cougo’s feet near her hand. He was right-side up now, glaring down at her from where he was stuck. “What’s she doing?” Clance asked, struggling in vain to look. Beebee hurried over to his spot beneath the pillar, shouting up at Shirka. “Let me see,” Shirka said. She stuck the cup on Cougo’s shin and gave the key a sharp twist. The suit expanded, scraping against the slab. Cougo was left stuck in the oversized armor, squealing as his legs were forced apart. “Ha! How’s that feel?” Shirka laughed. She began to twist the key in the other direction; Cougo’s armor shrank back. His jaw was forced shut and the visor squished against his cheeks. “You’ll kill him!” Beebee cried. “Guess you’d better leave, then!” Shirka said between her grit teeth as she worked the key further. Cougo’s ears were compacted against his head by the helmet; his nose bent crooked and blood flowed out from one nostril. “Alright, stop it! I’ll go!” Beebee wailed. Shirka grinned and eased the key back. Cougo coughed and sputtered, his face red as the helmet ballooned. “Hurry up and leave,” Shirka said. Beebee hid her face, skirting around the pillar and toward the hex door marked out on the floor with dull treaded metal. As she hurried, sobbing, she could glimpse the zeppelin docking at the port. Shirka let Cougo’s slab drop to the floor. She turned to watch Clance, who was struggling near the opening in the tower. “They’re here for you, Clance!” Shirka called. “They’re, uh, here?” She squinted through her eye-ring at the blimp: a gangplank was unfurled from the bottom, the back of the balloon was on fire, and a glimmering stream of liquid was flowing toward her. “What’s that? What’s leaking out of it?” Shirka wondered aloud. The water flowed into the room and crashed along the shining floor. With a sudden surge the flow leapt at the pillar, breaking upon it and sending the tools off in all directions. Shirka’s legs wobbled and a second wave followed the first: crashing down on her head. Her hat was blown off and she was swept away from the pillar in a foamy roar. “Alvy,” Beebee blurted out. The wave pushed the three remaining slabs away from the pillar: their tops remaining above the surface as they were dragged along with the current. Beebee braced herself as the water reached her; yet it swerved in a path around her body, held in place by a zigzagged boundary. Through the lines she saw Shirka tumbling in the current: flailing and kicking. She collided against the wall, where the water following her churned, gathering into a blob around her body. The rest swept past the pillar and left the slabs resting on the shining floor behind it as it rushed to Shrika’s position. She gagged and coughed; the water held her in place against the fall wall. Looking past the diamond-shaped pattern of the boundary she could see Mackaba walking into the room with the blazing zeppelin at his back. He held Calm’s gangly body in one arm. Frost spiraled in a bloom across his clothes. “Alvy,” Beebee uttered again. She hurried over to him, passing Cougo’s slab on the way. “I take it things aren’t going so well,” Mackaba stated. He set Calm to the floor. She mumbled, shaking her her head to and fro. “Calm, you were supposed to stop him!” Shirka shouted. She began to pull away from the wall; a gesture from Mackaba sent the water churning, forcing her back. “You’re crying,” Mackaba said, looking Beebee over. She nodded back, tears streaking across the purple bruise on her cheek. “She won’t listen to me—Alvy, she was torturing them.” She sniffled, looking over at Cougo on his slab. Mackaba started across the room, leaving Beebee behind. He scooped up one of the tools that had fallen: a pick with a winged design on the handle. At the pillar an image of an overturned vehicle appeared. Mackaba was inside, banging on the window with a white-gloved fist. “I know how she’s humiliated you,” Shirka said. As Mackaba walked, the sterile floor beneath him darkened and cracked: it became a paved city square where he saw himself on his back, wet and defeated. Behind her the wall turned to clear glass; the island of Jesice could be seen below it, buildings stretching out into the horizon. Around her the bodies of men wearing suits were scattered. “Mean and the Lords Ley—they’re the one’s who betrayed you,” Shirka spat. “They’re the ones that bullied you, lied to you, threw you into that prison!” Mackaba continued on, stepping around Slaberdashia’s boot. Mackaba weighed the pick in his hand. The barrier parted for him as he lunged at Shirka; she screeched as the blade pierced her stomach. She tottered, gasped, and fell. Beebee cried out as Shirka sloshed into the water pooled on the floor. Shirka coughed, pushing her body away from the floor. “So you won’t be baited, is that it?” she said. Taking effort to raise her eye to him, she winked. Mackaba’s arms snapped to his sides; in a flash a chain wrapped tight around his body and Shirka leapt up. She swung her hand at his face and he felt a cold material wrap around his entire head and pinch at his neck. “Containment mode,” Shirka whispered and the helmet revealed itself on Mackaba’s head. It was clear all the way through, displaying his shocked expression. “There’s one suit left, buddy-boy—mine.” Shirka’s black dress and bloody wound vanished—her body was instead encased in black armor tinged with rust. Her soaked strands of red hair stuck to the shoulders and she held the key-shaped tool in her fingers. With a grin on her face she pressed the cupped end to Mackaba’s visor. He let out a choke as she gave the key a slight twist. The odd water walls at their sides rippled. I also MIGHT want a bit more dialog in this chapter since all the siblings are gathered together. I guess that’s why there are some out-of-place lines just floating around without any indication of who is saying them. They’re IDEAS, man. You can’t tie them down. I have to say this scene is looking pretty good. I wasn’t sure how Shirka could threaten anyone as as long as they were trapped inside a contained suit of armor. But then I got to thinking about how the suits would have to be adjusted as the wearer inside grew. Well, this is unexpected. No, really! Sometimes these things just happen! I was going to have him fall to the ground but when characters attempt to do things that I didn’t plan sometimes I just need to go with it! After all, isn’t Mean the heroine of these books? I was going to have her in this chapter but things kind of took off in a different direction. Where is she!? 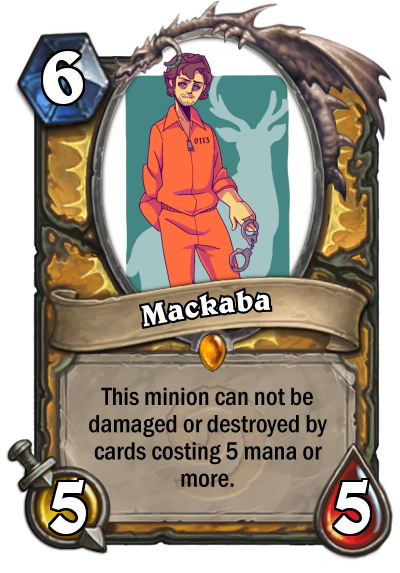 Get in here, Mean; you can’t let Mackaba have more page time than you! This entry was posted in First Drafts and tagged Arsiling, Beebee, Calm, Clance, Cougo, Mackaba, Pladomir, Shirka, Slaberdashia by Brad Smith. Bookmark the permalink. This is an exciting chapter! Mackaba to the rescue! Ha,ha,ha a way to absorb spells is sorely needed! Nice work!